About our Horticultural Abseiling Company: Pro Climb was founded in 2009 as a sole trading venture, providing contract climbing services to the tree care industry in Auckland New Zealand. We quickly established ourselves in the industry as a competent and reliable partner for all tasks concerning large tree climbing, tree felling, tree removals and tree pruning. Through this work we very soon realised that there was a great need for specialised training of modern climbing and rigging techniques for aerial arborists. In 2010 Pro Climb started its first series of arborist training workshops in modern tree climbing and rigging. Targeting qualified and/or experienced arborists and tree workers, our goal was to increase the productivity and safety of tree work for the climbing arborist. Our training is now an inherent part of many tree care companies around New Zealand. While conducting these courses we started to understand the needs of the companies as well as the needs of the climbing arborist for specialised health and safety training. We developed a unique program called “stay up to date”. This program is designed around the idea that a well-trained and experienced tree climber will not only be a productive worker but also a better rescuer in an emergency. Being a member of the New Zealand Arboriculture Association and of the International Society of Arboriculture has guaranteed that we stay involved with the development of new tree care techniques and industry guidelines. Our passion for tree climbing has led us to volunteering for regional, national and international tree climbing competitions. In 2012 Pro Climb established a residential and commercial tree care division and transitioned to a Limited company. Doing what we do best, we target two niche markets: scheduled large tree maintenance and low impact tree removals. Since then we have built a reputation with tree owners to offer sound advice, with a solid understanding of trees and their needs. We are a preferred council contractor for scheduled trees in Auckland. Pro Climb strives to be as eco-friendly as possible. Please read our environmental policy. We work with a small group of highly skilled and qualified professional contractors. All our climbing arborists are qualified and have a minimum of 8 years of experience in the industry. We enjoy sharing tree care and climbing related information, news and events within the wider arborist community and beyond. We do this via Facebook, and we publish a quarterly newsletter, occasionally contribute articles to the Tree Matters, and organise and participate in events. To make a booking for Commercial or Residential Tree Work, click here. 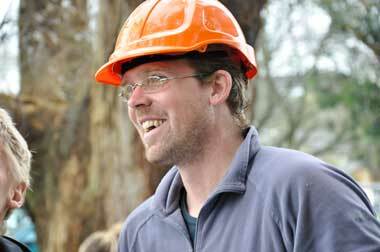 To make a booking for our Arborist Training click here. If you have any questions about our arborist training or tree care services, please don’t hesitate to contact us, we are more than happy to discuss your training needs. Find out more about Rossy visit his, Google+ Profile or visit our About Us page.